What experience do you have and how does it serve your clients? With over 10 years in construction, I have distinct knowledge about the building and construction industries—this helps me take care of clients’ needs, no matter if they buy directly from our extensive product lines or if it’s a custom project. And like all Rocky Mountain Hardware employees, I am committed to exceptional customer service. All of Wyoming and Teton County, Idaho. I see the construction industry thriving in Jackson Hole for the next five to 10 years. Jackson is a very desirable place to live and construction, real estate, and tourism are leading industries in Jackson. I see Rocky Mountain Hardware continuing to grow and expand as it has been doing since its inception. The projects that include our gorgeous bronze from the entry door throughout the entire house. Rocky Mountain Hardware is gorgeous, handmade in the USA (locally really, right over the hill in Idaho), and functions superbly. Using the hardware throughout the house allows for a consistency of quality and design, giving a sense of coherence to the house. I love the construction industry, and I love being able to get out into the field, interacting with architects, designers, contractors, and clients directly, and helping them along the way with their hardware needs. Hardware is one of the finest finishes in a home and should never be overlooked. Sirius/XM satellite radio, Outlaw Country, The Spectrum, Classic Rewind, Classic Vinyl, and occasionally The ‘80s and ‘90s. The places I have not been. I love to travel, explore new places, and learn about other people and cultures. It is so refreshing and always puts life into perspective. If you could own three “toys”, what would they be? A private jet to take my family wherever we wanted to go. A moderate-sized yacht to cruise shores and isles of our favorite and yet-to-discover destinations. And a few more boats for various types of recreating. The list is long! Ireland, Scotland, the Bahamas, the Amalfi Coast, and the mountains of Italy—all of the Alps for that matter—and Greece. If you had one wish today, what would it be? Given my last few answers, to win the lottery tonight. My wife Betsy. She is my best friend, and I enjoy doing everything with her. Winter. I was born in February, and I love winter sports like skiing and playing hockey. I actually love all seasons and the changes that come with them. Jackson has all four—some are just a bit longer than the others. Last book that you read that you would highly recommend and why? The Old Man and the Sea and The Sun Also Rises, by Ernest Hemingway. I would definitely recommend them because they are classics for a reason! 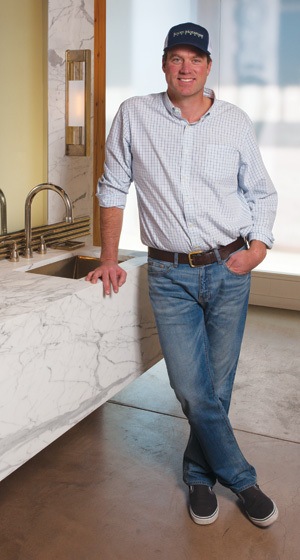 Kevin Rooney, the other half of the Rocky Mountain Hardware Jackson showroom, brings a wealth of construction experience to his position. With a decade of construction work under his belt, Kevin understands the importance of good hardware, and he has a keen eye for good craftsmanship. We can all agree that it’s pretty hard to sell something if you don’t believe in it. That is not something Kevin has to worry about. He knows that the products he sells (both RMH-made and other brands) are top-of-the-line and high-qu ality. A family man, Kevin stays active skiing (in the winter) and playing hockey (whenever he can).